Why yes, I did ring in the new year with tabletop RPG-ing. And yes, I know the photo is blurry. 2016 was a dumpster fire for most of the world. Mass shootings, Brexit, President Elect Trump, the loss of so many icons… For me personally, 2016 was a pretty good year despite these outside stressors. I read a lot of good books, played a lot of good games, helped raise a lot of money at work, and spent time with family and friends. I didn’t read quite as many books as I challenged myself to (came in four short of my 24-book goal—much better than 2015! ), and I almost completely stopped running. For 2017, I’ve made another Reading Challenge goal of 24 books, and I signed up for the Carmel Half Marathon on April 22. Less measurable are the things I’m not doing for myself, but because of who I am. I will continue to support organizations that fight for women’s health and equality for all Americans. I will support the Democratic Party of Indiana to ensure the 2018 and 2020 elections aren’t a slap in the face like 2016 was. I will continue to speak (or write) openly about my opinions on politics, mental health issues, and other topics that I feel strongly about. I won’t do everything right, and I’ll probably fail at something at least once this year. But it’s a new year, and with the ashes of 2016 behind us and the days inching closer to spring, we can say that today is a little brighter than yesterday, and tomorrow will be a little brighter still. 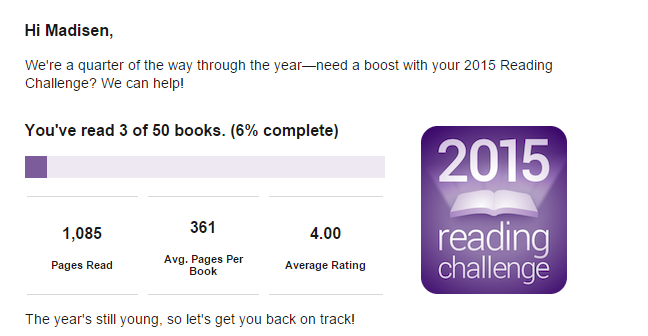 In January 2015, I set myself the ambitious goal of reading 50 books during the year. In April, I was 11 books behind schedule, and just never really got on track. I knew 50 books was an… aggressive amount of literature to consume in a year—that’s nearly one book per week, and I’m no longer an English Literature major where 75% of my assignments are reading novels. But I thought, Hey, why not go for the challenge? The answer to that question is ain’t nobody who buys a house, has a full-time marketing job and a husband, travels, and maintains a healthy interest in video games and movies got time to read a book a week. I love reading. I wish I could be paid to read all day long. But I don’t necessarily want to chain myself to books for a whole year to complete some arbitrary reading goal. Yes, I could exchange the dozen or so hours I spend playing Guild Wars 2 per week reading, but why would I do that when I’m having fun gaming? I wouldn’t, and I won’t. I didn’t hit my other goal of finishing my Harry Potter re-read before the end of the year, so completing The Half-Blood Prince on Jan. 3 counts as book 1/24. I’ll start The Deathly Hallows this week, so there’s book 2/24 for January. I’m going to force myself to read The Curious Incident of the Dog in the Night-Time that’s been sitting on my shelf for six months, I have a half-read Tiffany Reisz novel I found in a moving box in November to finish, and I got a Barnes & Noble gift card for Christmas that I’m going to use to buy The Bell Jar because I’ve been meaning to read that book for longer than I care to admit. Look at that, I’ve got books planned into March! Goals can be easily accomplished when you set a plan for yourself and give yourself the tools or time needed to succeed. Maybe that’s the underlying theme of 2016 for me: Make a plan. Achieve my goals. You know when the new year starts and you’re making all kinds of resolutions to get in shape and eat better and read more and spend more quality time with family and friends? Yeah, I made all those resolutions this year. And you know how they slowly start to fade away because unless you joined a fitness group or paid money for one of those healthy meal solution plans, no one’s really holding you accountable? Yeah, they’ve been fading for me, but no one noticed so I didn’t worry about it. Yeah… I knew I had challenged myself to read 50 books in 2015 at the beginning of January, and I knew it took me a little longer to get through All the Light We Cannot See than I had planned, but no big deal, right? No one’s actually keeping track of how many books you’re reading. Well, turns out Goodreads is keeping their members on track, and sending them emails to guilt encourage them to get back on track. It’s like a virtual fitness group for bibliophiles, and I’m actually totally okay with that. So while my guilt-tinged heart is embarrassed that we’re a quarter of the way through the year and I’ve finished a grand total of three books, I’m happy for the reminder that someone/something is holding me accountable to the goals I’ve set for myself, and that I get handy email reminders in the process. And hey, I’m devouring a great book right now and have several more in reserve to read once I finish. So, FYI Goodreads, you’ll be seeing some updates from me soon. And, bonus, for every book I read, it’s a new book review blog post for you! Killing two birds with one book-shaped stone.